Periodically we see some concern over the state of certain attendance figures in Australia’s various football codes, and its time some of these critics had a good look at the figures and their place in the big picture. Here in Australia we are blessed with four codes of football, two major and two minor players on the national stage, and all drawing average crowds of over 10,000 to games. This is a situation not really replicated in too many countries around the world. The problem for three of the codes is that they are going to be perenially compared to the biggest attendance driver of the four, and one has to ask – is that really a fair way to examine the crowd situation. Today, I want to look at the four codes, and why attendances arent as dire in any of these codes as some might have us believe. So lets get this out of the way, Australian Footballs top league, the AFL, in 2017 drew average crowds of 35,207 and total attendance of 7.23 million over the course of its 2017 season. The AFL is the only professional Australian Football competition in the world, and in 2017 benefited from strong attendances in Adelaide where it averaged 42,393, Perth where it averaged 34,563 and Melbourne where 4.4 million people attended football at an average of 42,911. Even in Sydney, the Swans managed average attendances of 34,474. Perception remains that the AFL is better viewed live than on TV due to the wide expanse covered by the game play, and ticket prices for General Admission have barely moved relative to the average wage since the 70s, while the AFL has been developing a membership program since 1984. Stadium initiatives to drop food and drink prices at the MCG and Docklands, new stadiums and facilities at Adelaide Oval, SCG and Perth Stadium, free entry for children on sundays and cheap entry for kids under 14 for every match anyway, plus a healthy dose of good form from some of the bigger sides in the competition, and the attendances keep coming. The AFL has benefited from a hugely profitable and popular era, without any of the off field governance dramas being experienced by the NRL and FFA, as they sought first to establish themselves, and then more recently to battle internal struggles over governance with clubs, and unpopular moves with fans. The AFL has also benefited from being massively covered by television and print media, as well as its own internal arms. The National Rugby League, composed of teams from Australia and New Zealand, is the peak competition for rugby league in Australia, if not the world. In 2017, the competition averaged 15,704 through the gate across the season. The other professional competition, Superleague, this season features teams from the United Kingdom and France, and averaged 8,568. In addition, Australian rugby league features a highly attended State of Origin series, quite unmatched by anything else in the rugby league world. The progress of professional rugby league was stymied somewhat by the Superleague shenanigans of the mid to late 90s, and the aftermath which saw a number of teams dropped or merged. 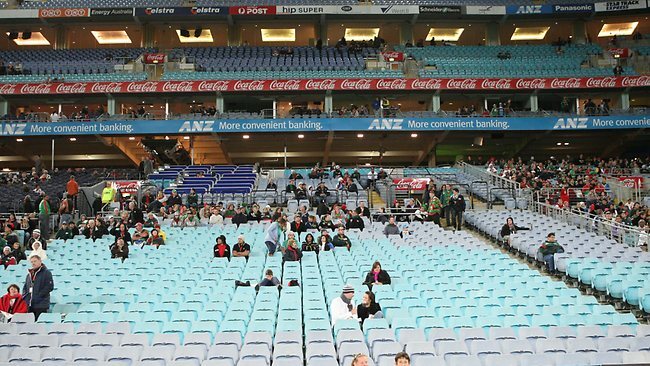 NRL crowds hit their peak in 2014, but a combination of poor scheduling, outdated facilities, and poor weather have seen the League unable to deliver on its prediction that it would reach a 20,000 average in 2017. For its part, the NRL has in recent times pushed memberships as an alternative, and has set membership records year on year in a sign that program is working. The NRL also claims to have regained control of its scheduling from broadcasters, however some time slots – especially early Friday – remain very unpopular with attendees. Clubs and stadiums are working together to deliver cheaper ticketing, including double header events and reciprocating entry for members of competing teams, as well as reducing the price of food. This may be having an effect since NRL crowds are experiencing a 5 year high over the first four rounds of the season in 2018, although this may in part be due to the Easter weekend being earlier than usual. Over the next couple of years, a new stadium will open in Parramatta, the Sydney Football Stadium will be rebuilt and Stadium Australia will undergo refurbishment, with the not unreasonable hope that modern and shiny facilities will have a similar effect on attendance that was experienced by crowds at Adelaide Oval (opened 2014) and currently being felt at Perth Stadium (opened 2018). The A-league, comprised of teams from Australia and New Zealand is the peak competition for association football in Australia. In 2017, its attendances averaged 12,647 in 2017, which made it the 17th ranked association football league for crowds in the world. It should be noted that while the attendance is lower, the leagues above are mostly in countries where association football enjoys top billing in the nations sporting conscience. (exceptions being the USA and India). The A-league was effectively a new competition born in 2005 after the disbanding of the National Soccer League, and has had a number of issues with teams being dropped for financial reasons over the journey. Attendance peaked in the 2007-2008 season, and fans in recent seasons have dropped off, citing issues such as stagnation over the season (the league has ten teams and plays 27 rounds) with no promotion/relegation as experienced in other leagues, poor scheduling, poor ticket pricing, poor crowd management, poor promotion, poor media coverage and New Zealand. In addition, the governing body’s apparent war with active support groups over banners, flares and other activities is likely another factor, costing the A-league and association football in Australia the rich atmosphere typically experienced at similar leagues held around the world. This may have affected crowds at Wanderers and Victory matches in particular. For all this there are positives, with improving crowds in Newcastle and Adelaide. Then there are stadium issues, particularly in Sydney where the drop in crowds is being felt the most. Like the NRL, new stadiums in Western Sydney, and the Sydney Football stadium, and a refurbished ANZ Stadium could be pivotal in changing the fortunes of the A-league crowds in Sydney where the supporters have flatly refused to travel to Spotless Stadium in numbers, and Sydney FC have experienced a downturn at the SFS despite superb form. If Brisbanes proposed Ballymore development gets off the ground, and the new SA Government delivers on its promise of a new stadium in Adelaide, we could see a huge uptick in attendance across the board in the new future. The Natiional teams have proven to remain popular, and the Mathildas have made material gains in support over the last few years, while visiting international sides have also experienced great attendances. The fact remains that the A-league has been unable to capitalise on any of this due to timing and other factors. The A-leagues attendance problems may well all be linked back to the way the domestic competition is administered. FIFA, the FFA and various interested parties are working on this with a view that will hopefully lead to changes. The FFA has somewhat controversially called for expansion, and a second tier competition has already been proposed by state level clubs. We should start seeing some reform next year one way or the other, but i believe that 2020 might be the year the A-league really hits its straps again. Super Rugby has morphed in a 6 country tournament, featuring teams from Australia, New Zealand, South Africa, Japan, and Argentina. In Australia for 2017, the then five Super Rugby sides averaged approximately 11,298 for the season (several games had no reported attendance). this would put the Aussie contingent behind the average crowds for Top 14 (~13,798) in France and the Aviva Premiership (15,065) in the United Kingdom. The Australian team average is on par with the Currie Cup, South Africas domestic competition. In 2017, the Australian Rugby Union announced that a team would be dropped from the Australian contingent, and later that year the Western Force were removed from the top flight rugby competition. It hasnt been all negative, with the Rebels recording their best home crowd figure – just over 16,000 – in their most recent home game. Australian super teams find themselves in a position where they spend far too much time overseas and not enough time in Australia, playing Australian sides, and this has to have an affect on the people who turn up. I still believe Australia sacrificed a long term future for short term gain when it joined in Super Rugby, and it may be a difficult road before we see any substantial improvement. Fans and pundits need to essentially ignore the AFLs attendance figures. Its a statistical anomaly in Australian sport and its the product of 120 years of strong attendance, strong membership culture, and in the last 40 years, strong promotion, extensive government support and funding and lets face it, probably excessive media coverage across many states, while maintaining almost every team since it was formed in 1897 (University left of its own volition after World War 1 due to wartime losses, and Fitzroy was merged with Brisbane in effectively name only, the team continues in the VAFA), and having had a distinct lack of fighting between the Commission and its clubs since being formed in 1993. All of the positives and almost none of the negatives. We also need to acknowledge that we have 4 professional codes of football in Australia in a relatively small population, with the NRL and Super Rugby sides largely confined to the East Coast. Rugby Union, battles for acknowledgement in the Australian winter against the all pervasive NRL and AFL, while in the spring and summer, the A-league has run headlong into the cricket, particularly the expanding Big Bash, and ends its season at the start of the AFL/NRL ones. In context, NRL crowds are likely fine, and best in the world for rugby league. The A-league, up againt the behemoth that is cricket in the summer, and finishing against a heavy starting AFL and NRL, a 12,000 average is probably not as far off being acceptable as some would have you believe. Australian Super Rugby, faced with minimal matches against other Australian sides, and up against the NRL/AFL combination is also probably drawing crowds of a reasonable expectation when you consider all the factors involved. Can things be better? Sure. Theres always room for improvement, and the AFL, NRL, ARU and FFA should never stop trying to be better. and perhaps stadiums a little more apropriately sized. But theres no need for the hyperbole around crowds either.